More children got reading at their local library this summer than last year, according to new statistics released last month by The Reading Agency and the Society of Chief Librarians for the 2017 Summer Reading Challenge. A total of 761,758 children across the UK took part in Animal Agents, the 2017 Summer Reading Challenge, at their local library. This is an increase of 6,550 (0.87%) on 2016’s total, despite the still challenging climate facing UK public library services. “The books inspired me to read more about animals and more than that it was fun solving mystery. It’s helped me quite a lot with my reading skills.” Girl, 8-11, London Borough of Hillingdon. Research shows that only 1 in 4 boys read outside of school every day. This year’s Summer Reading Challenge participant report shows that 44% of Animal Agents participants were boys. “I enjoyed the Challenge this summer, it made me choose books that I wouldn’t normally read and see how different authors wrote their stories. It was lots of fun visiting the library especially the scratch and sniff stickers!” Boy, 8-11, West Sussex. This year’s overall figure includes 27,206 pre-schoolers who took part in the specially designed Mini Challenge – an increase of 7.05% on last year. The Mini Challenge enables younger siblings to have their own “Challenge”, provides a family friendly introduction to the local library and helps parents and carers build confidence to share and read aloud with their children. 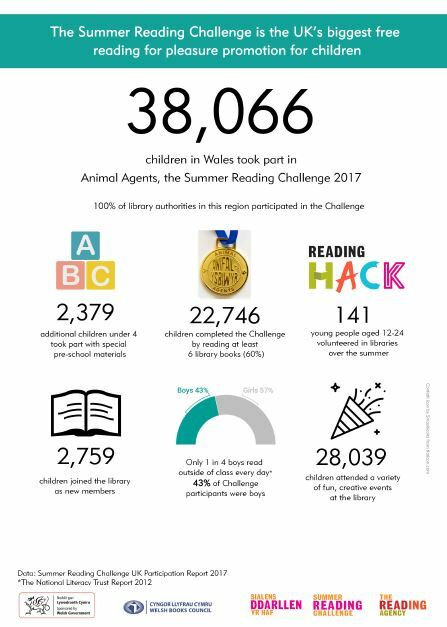 To add to the good news, Animal Agents fostered increased online engagement on the official Summer Reading Challenge website. 192,358 users (an increase of 24.7% on 2016) spent more time on the site engaging with content and other users, with large boosts for page views (+154%); chat (+216%), and book recommendations (+159%). Each year the Summer Reading Challenge to children is simple. They’re encouraged to read six or more books of their choice – fact books, joke books, picture books, audio books just as long as they are borrowed from the library – during the school summer holidays. There are collectable incentives and rewards, plus a certificate for every child who completes the Challenge. Children can sign up at their local library as the holidays begin. 97% of UK authorities (excluding Northern Ireland) took part in the Summer Reading Challenge this summer. The full Summer Reading Challenge 2017 Participation Report is available to download on the Reading Agency website. In Wales, the Welsh Books Council supports the Summer Reading Challenge through sponsorship from the Welsh Government.